This is an accomplished kid’s-eye-level look at Germany, including its food, recreation, education, and family life. 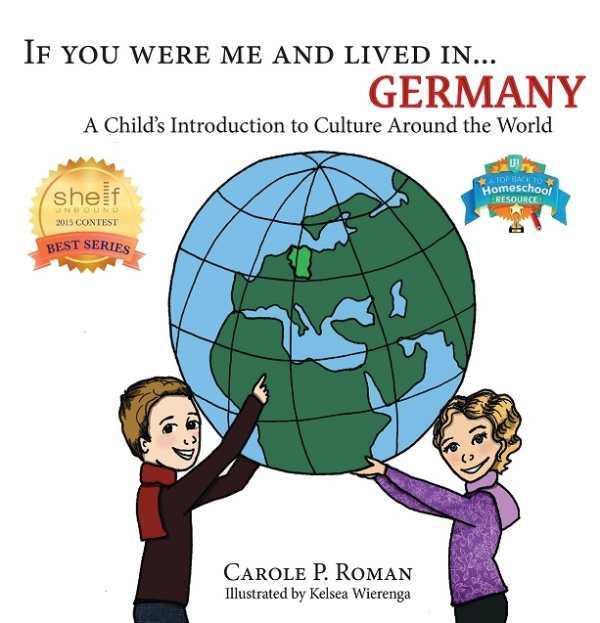 Despite being one of the major powers in Europe, Germany is largely unknown to many American children—a situation Carole P. Roman aims to remedy with her children’s picture book If You Were Me and Lived in … Germany. Opa [Grandpa] would tell you that a euro is not German money. It is a European currency that replaced the German marks that were used when he was a small boy. Roman is skilled at bringing a country’s culture down to kid-friendly level, a perfect example being her mention of Neuschwanstein Castle’s architecture inspiring the Sleeping Beauty Castle at Disneyland, or her highlighting of Hamburg’s Miniatur Wunderland, the world’s largest model railway. Neuschwanstein Castle is depicted by a photograph, with the main characters drawn and superimposed in front, as if they were taking a vacation photo. Wierenga’s illustrations use a similar method on some pages—showing the rosy-cheeked children standing outside a photographed snow-covered building, for example—while on other pages she draws the entire scene herself. Both techniques effectively provide a visual picture of Germany and its culture. You had to write a report on five important facts about Germany. Papa helped you find some interesting things. Similarly, the proper pronunciation of Munich is addressed via the clumsy German of an American Tante (aunt). This is an accomplished kid’s-eye-level look at Germany, including its food, recreation, education, and family life, complete with a glossary and pronunciation guide.